Successfully Added 4 Channel DVR System "Secure View" - 2 Indoor + 2 Outdoor Cameras, 700TVL, 500GB HDD, H.264 to your Shopping Cart. 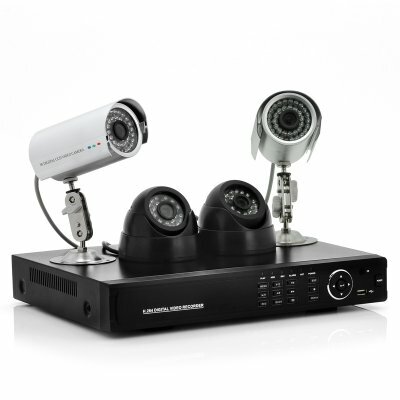 4 Channel H.264 DVR System with an included 500GB HDD as well as 2 indoor and 2 outdoor cameras with a resolution of 700TVL is the extra eyes that are needed to boast your protection. This incredible and extremely versatile DVR "Secure View" security kit with 4 channels is your professional and high performance audio and video solution for surveillance. Ideal for home and office, private and public, this DVR includes everything you need to instantly set up a security perimeter. You can connect the DVR to your monitor and watch the surveillance video as you can choose any camera or have 4 of them on screen simultaneously. A combination of 2 waterproof outdoor and 2 indoor dome cameras allows this security surveillance kit to become even more diverse in where the cameras can be located. The 2 outdoor cameras are waterproof and have 36 infrared LEDs to help give a clearer picture of any footage it is monitoring. The indoor cameras are stylishly domed shaped and have a moderate 24 IR LEDs. With H.264 video compression, the video records at a lower bit rate but with higher quality, which just means better video and less storage required. H.264 is a standard for video compression, and is currently one of the most commonly used formats for the recording, compression, and distribution of high definition video. The cameras that come with the “Secure View” security package have a horizontal resolution of 700 TVL, which means the picture is created by electron beam scanning from the upper left and moving horizontally to the right and moving down until it reaches the lower right of the screen. 700 TV lines mean that it takes 700 scans to get the job done and this is repeated to produce a clear image. The “Secure View” security DVR and camera package even comes with a full featured remote control to help control your DVR from a distance to make operating it that little bit easier. 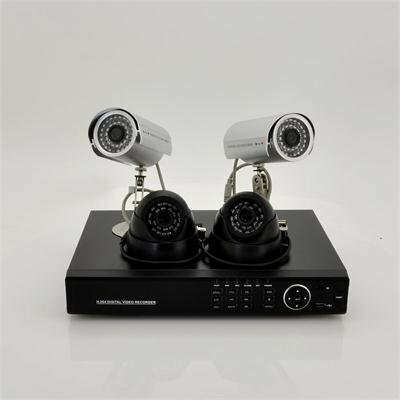 The “Secure View” DVR has a selection of ports for connection as well to back up and transfer data, one of these ports is a HDMI, which is becoming a popular connection with most electronic hardware due to the clear quality picture that can be sent via a connection. A handy feature is that you can monitor what the cameras are viewing via your mobile phone, and the software is compatible with major mobile operating systems such as iOS and Android. A great standalone solution for your security and DVR needs, this complete DVR security system “Secure View” comes with 4 cameras and plenty of useful features to give you everything you need to immediately set up your own security zone. This product is in stock and can be dispatched within 24 hours of ordering with a 12 month warranty. Brought to you by the leaders in wholesale electronics and security DVRs, Chinavasion.